A. Micah Smith is a Kansas City-based Creative Director specializing in Illustration & Design. He got his start making shirts & posters for his favorite bands and has since created campaigns and experiences for select clients including TED, ESPN, Pepsi, Taco Bell and the Country Music Hall of Fame. His work has been recognized in many books and magazines and most recently on his mother’s refrigerator. Creativity was a big part of my childhood. My parents weren’t in “creative” fields, but they were creative in all they did and still are. My Mom worked at a dentist office when I was young and my Dad ran our family dairy farm in rural Oklahoma, but has done a lot of things since, from law enforcement to A/V installation. I remember first connecting the dots with creativity while watching cartoons and reading the credits at the end. I’d recognize the names and associate them with greatness. I’d tell my Mom that this one would be good because Eyvind Earle did the background art or that Friz Freleng directed this one just like that other one I like. I remember starting school and finding comfort in art class. Our elementary art teacher, Mr. Donley, would tell us any field can be creative. He’d go around the room, ask all of us what we wanted to be and then explain how an accountant or an astronaut could exercise creativity. When he got to me, I lobbed him a softball: I wanted to be an Imagineer at Disney…or a ghostbuster. DURING MY JUNIOR YEAR OF COLLEGE, I was over halfway through a business degree and not really sure what I wanted to do with my life. This was the early aughts and I loved making t-shirts for friends’ bands and for my college. However, I didn’t know what I was doing. Like, I literally didn’t know how to do what I wanted to do. I was using Macromedia Flash for anything vector because the only Adobe program I knew was Photoshop. This was the heyday of Gigposter art and I was in love with that whole world. I would look at what was being posted to Gigposters.com (RIP) and simultaneously love what I saw posted and wonder how to bridge the chasm between what I saw and what I was making. One group in particular that I loved was Asterik Studio (now Invisible Creature) in Seattle. Over Spring Break that year, I decided to fly out and see if I could convince/fool these guys into letting me intern for them that Summer. I vividly remember Don telling me that day that if I wanted to come out to Seattle from Kansas for the Summer for an unpaid internship that they wouldn’t stop me. Sometimes others push you and sometimes you push yourself. That internship was a lot of both. I could have stayed home that Summer and my life wouldn’t be what it is today. I was only there for a few short months, but I absorbed anything and everything I saw. I still wasn’t very good when I left, but I’d seen what was possible. I’d experienced firsthand what I wanted to do and I couldn’t go home and be static about it. Most of the Asterik guys had been in bands and connected me with some old tourmates in Kansas who’d started a screenprinting shop in Lawrence called Blue Collar Press. It was started by or employed bands I’d loved since high school: Coalesce, The Get Up Kids, The Anniversary, The Appleseed Cast. This is where I cut my teeth. I was able to try, fail, and be anonymous. I was able to explore with subject matter that called for experimentation. This was big. When you have a big backyard, you don’t have to worry about the ball landing in the neighbors’ yard all the time. Constraints are important now and are necessary, but I found it was important starting out to kick the ball as far as I wanted and go get it without others having to notice how many times it went over a fence. At Blue Collar, I started making gigposters. We started by making them for local bands, then we made them for national bands playing locally, then those national bands would contact us about doing posters for shows not in Kansas City. Looking back, it all happened fast. About a year after we started, Myspace cold-called us. They said they’d heard we made posters and were starting a new music series called Secret Shows. They were having huge bands play small venues for free and would like us to make a poster for every show. Over the next few years, I probably made around 100 posters for this series and got to see a lot of them in person including Tenacious D, Gnarls Barkley, Clipse and The Cold War Kids. By 2010-11, I was in my late twenties and had reached a lot of the goals I had set for myself professionally, like the kinds of projects I’d been able to work on and clients I’d attained. I wasn’t “going through the motions” by any means, but I was at a point in my career where I was assessing where I’d been, where I was and where I wanted to go. One thing I noticed at this time was that the vast majority of my portfolio were poster projects. If you look at my portfolio today, there are still a lot of posters in there, but much less than there were back then. I wanted to show my skillset in other areas and the only way I knew how to do that was to make the kind of work I wanted to do and pursue it from there. It was a risk because I was definitely known as a “poster guy” and stepping out into other areas weren’t sure shots by any means. It wasn’t like I was redefining who I was, but I knew that the type of work I was known for could exist out of the medium of posters. So, I stopped pursuing it. I still make posters and love making them, but I let that work come to me instead of the other way around. There are tons of people that I consider influences. Here are just a few that come to mind and granted I could give you another completely different list tomorrow: Walt Disney, Nolan Ryan, Jim Henson, Norm MacDonald, and The Get Up Kids. Logo Design for Salemtown Board Co.
Do you ever worry that living in the Mid-West means you are missing out on something bigger? Just this week I was contacted about a project and they assumed I was in LA. I didn’t get the gig, which I’m not sure if, in the end, it was because of my locale or if someone else got it for whatever reason, but I’m fine with either of those scenarios. I’ve been to LA. It’s nice, but I like where I live. If a few projects here and there make me question where I live, then I think I should go where I don’t have to constantly question my surroundings. I love where I’m from and where I live. Also,I feel like questioning where I live in these situations isn’t too far away from puzzling over if I wore the right color shirt when meeting a client. I’d rather just be where I want to be and let the creative gods roll their dice on that kind of stuff. What advice would you have for young creatives starting out? Relish your anonymity and try different things with your art while no one is looking. Not having a fanbase or accolades right out of the gate isn’t something to be ashamed of, it’s actually a gift in disguise. I wish I would have known that when I started. What has been your favorite project you have worked on? In 2014, I spent a good portion of the year working on the TEDGlobal Conference, which was relocating to Rio De Janeiro after being held in Edinburgh, Scotland for several years. At the beginning, I only created the illustrations for the branding of the conference, which was a big project unto itself and what I thought would be the full extent of my interaction with the conference. However, next, I worked with almost every team at TED on redesigning the attendee badges, which had been something the TED team and I had danced around for almost a year prior. This project was special not only because my work touched so many different aspects of the conference and I worked with so many different teams but also because TED invited me to Rio as an attendee. Enjoying the TED conference and hearing amazing speakers like Ricardo Semler and Glenn Greenwald was incredible, but visiting Rio and Brazil for the first time, staying on the Copacabana, and seeing Christ the Redeemer up close were what pushed this project to the top of my list. I’d be a comedy writer. I’d love to be a fly on the wall of a great show listening to great writers punching up jokes. Getting in on the fun myself would be a dream. It’s clear you have fun with your illustrations and your sense of humor is always evident. How HAS your work inspired by your personal interests and possible life experiences? I enjoy introducing levity into my work as much as I do into social situations. It’s fun to do and also usually helpful when things are too serious…and things are usually always too serious. If you can make someone laugh, then you’re removing a wall. When you trust someone, you can let your guard down. I find humor is a great communication tool with my art for this very reason. We’re taught to put our guards up in the world and for a very good reason, but if I can get through those barriers with my work by making people happy then I consider it a full success. This all derives from my deep love of comedy. I regularly see comedians when they come to town…or as regularly as you can when you have young children. I saw Nick Thune at the Record Bar recently, which was great. Back when I used to go to SXSW for Flatstock, I’d spend the evenings at Esther’s watching Hannibal Burress, Kyle Kinane, Todd Barry and a million other comics. In the same way I love Saul Bass, Alvin Lustig, Alexander Girard and Charley Harper, I love Lorne Michaels, Harold Ramis, Larry David and David Letterman. What type of project is the most enjoyable and allows you to be the most creative? It may sound cliche, but I like challenging work from great people. Whether it’s branding, illustration, packaging, environmental…all of those can be a bummer if the brief is humdrum or the people associated are buttheads. I like work that’s a challenge in the sense that it’s realistic work, and from great people, which means ‘great’ by nature, not by accolades or stature. I don’t care if you’re the biggest client on the block, that doesn’t give you the right to be a jerkface. It can be a small client or project and still be challenging and involve quality people. One out of two doesn’t work well either, great clients without challenging work can be the better of the two though because challenging work from nightmare clients is never worth it. WHAT IN KANSAS CITY INSPIRES YOU? IT’S EVERYONE IN THE CREATIVE COMMUNITY. Hands down. I may not know everyone personally, but you see what they’re doing. I want my work to stand up next to all of the great work everyone is churning out, so it’s good inspiration AND motivation. Just follow Lynn Giunta on Instagram…you’ll see what I mean. It makes you want to be better. Gives you goals. This city is rich with talented people. Do you have any favorite books that have been particularly inspiring or encouraging to you? Born Standing Up by Steve Martin. I listen to a lot of comedy podcasts and read as much as I can on the subject. I pull a lot of inspiration and processes out of the way comedians work. It fascinates me as a medium. You’re basically naked except for a microphone and somehow harnessing a large group of people’s attention. It’s magic. No one’s ever done it better than Steve Martin and in his bio on the subject he goes into the details and logic behind his work. It’s a master class and one of my favorite books. Austin writes great books. This one is my favorite of his. He’s a great follow on Social Media too. It’s really digestible and has great accompanying illos. My favorite anecdote in the book is about how Harold Ramis, as an aspiring, young writer, would always look for the most talented person in the room and go hang out and help them in whatever they were up to. It’s refreshing to know that giants like Ramis didn’t always see themselves as the main attraction. It’s helpful to check our ego and know, especially in our look-at-me field, that it’s not always about us. I read Seth everyday. He has a blog that you should subscribe to right now. I love this book because it feels like his blog and a magazine had a baby. I buy copies of this book to give to people. It’s just great to have around and kick you in the pants whenever you feel like you need a good kick in the pants. 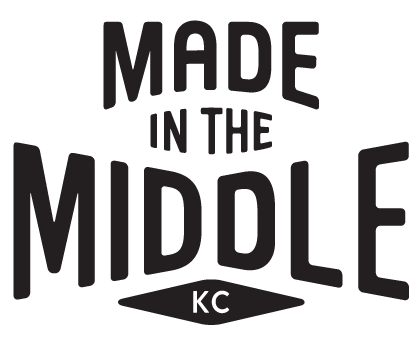 What's the best part about living in Kansas City? My family. We really enjoy being together and, after living in Nashville for 5 years, it’s great to be closer to them. We get together and just laugh. Now that we have kids it’s great to have family close by that they can know and be around too. Who should EVERYONE be following on Instagram right now? The River Market Antique Mall is the best antique mall you will ever go to. Four stories of awesome. I used to work next door to it and would go walk it during lunch for inspiration. I’ve scanned a ton of found ephemera from there that has landed in my work one way or another. Mills Record Co. is the best record shop in KC since Recycled Sounds. It’s great to have a good music store to visit in town since I was spoiled while in Nashville with Grimey’s. Mills has a great selection and lots of great used vinyl too.